The genus Muntingia, belonging to the tropical plant family Elaeocarpaceae, has only one species, Muntingia calabura, Jamaican Cherry. Lifespan: Estimated to be 30 years maximum. Growth rate: Rapid. Can grow 13' tall in two years. Mature Size: 25-40' high and as wide. Flowers: In clusters of 1-3, with five white petals and prominent yellow stamens, lasting only one day. Each flower is at the end of a long stalk raised above surface of the surrounding leaves. As the fruit develops after pollination, the stalk drops below the leaves where the ripe berry can be plucked by birds without disturbing the pollinating bees above. Bloom: A few flowers bloom each day, continually throughout the year in tropical climates. In temperate climates, blooming will cease during the four to six coolest months. Years before fruiting: 18-24 months. Fruit: Round, 1/4" - 1/2" wide, smooth, thin, red skin. Light-brown, soft, juicy pulp, exceedingly sweet, flavored like cotton candy or caramel, filled with tiny, barely noticeable seeds. Cold weather may cause a change in flavor. The fruit are high in vitamin C and antioxidants and have been shown to possess strong anti-inflammatory properties. Months for fruit to ripen: 6-8 weeks. 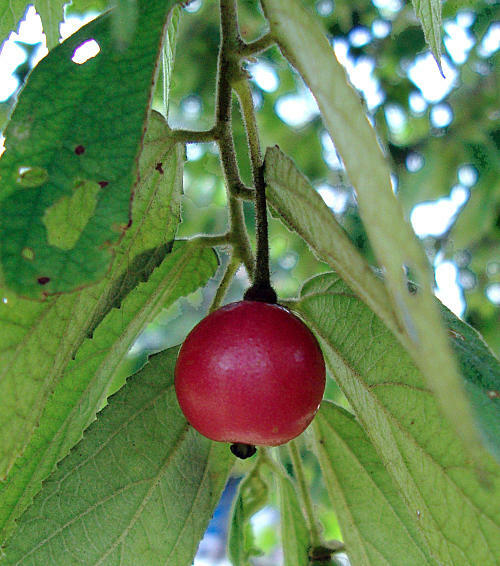 The fruit are ripe when the skin turns fully red, but will not ripen further once picked. They ripen individually, and should be checked twice a day. Storage after harvest: The fruit are normally eaten raw, frozen, or processed immediately. Leaves: Lance shaped, irregularly toothed, dark-green on top, light green underneath. Roots: Spread very wide; suckers in moist soil. The suckers do not transplant and should be removed. Wildlife: The flowers attract bees; the fruit attracts birds, fruit bats and small mammals. Origin: Mexico, the Caribbean, Central and South America. USDA hardiness zones: 10-11. Young plants must be protected from freezing temperatures. Established plants will withstand 29°F with some branch dieback. Heat tolerant:This plant does better in temperatures between 60-90°F. It may need extra water above 95°F. Water after becoming established: Once or twice a week, especially when fruiting. Soil: Well draining, very tolerant otherwise, but not salt tolerant, pH 5.6-8.5 (acidic to alkaline). It grows well in poor soil in tropical, high rainfall regions and is considered a pioneer species. Fertilize: Use compost, spread over the root area, once a month during the growing season, especially when growing in a container. Mulch: With compost, to protect roots from extreme heat and cold, and to retain soil moisture. Spacing: 25' apart, or closer if this fast-growing tree is being pruned yearly. Prune: To shape and reduce height, but prune no more than 30%. Any pruning reduces fruit production. Litter: Moderate leaf and branch drop. Propagation: Seed planted immediately after harvest, seed cleaned and dried, cuttings, air layering. Uses: Ornamental, edible fruit, bird garden. The fruit is eaten raw, made into jam or cooked into pastries. A tea with anti-inflammatory and anti-bacterial properties is made from the leaves. Children often pick and eat the raw fruit off the tree, getting sticky hands. 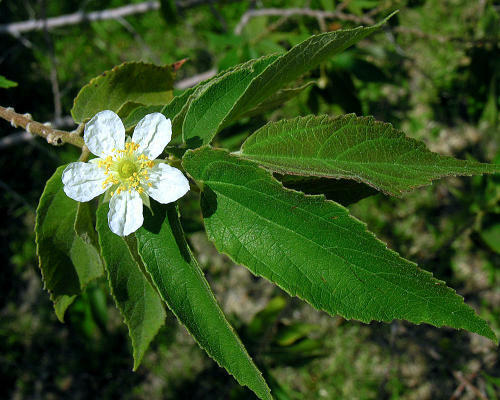 Other common names are Panama Berry and Cotton Candy Tree. While it is sometimes called strawberry tree because the flowers resemble those of strawberries, that name properly belongs to the European species Arbutus unedo. This tree is considered moderately invasive in regions with moist soil, due to root suckering and bird propagation. Netting may be required to keep birds and bats from stealing the fruit. The plant has little commercial value because the fruit ripen only a few at a time and are highly perishable, but it is an excellent residential tree.